Sean Payton's 100th game as the Saints' head coach, a milestone in its own right, illustrated many of the reasons Payton is both the most accomplished coach in Saints' history and, in a coach-driven league, the league's highest-paid head coach. On Monday night, a venue where Payton has flaunted his wares at the expense of overmatched opponents time after time after time, the Saints took another step in putting it all together in 2013. At 4-0, the Saints are perfect in the most relevant way. In other ways, they are far from perfect. But whatever those imperfections are right now, they haven't prevented the Saints from winning. The Saints' offense, for the second week in a row, flashed hints of its years-long reign of supremacy as Drew Brees, yet again, unlocked an opponent's defense with an indiscriminate precision and grace. Sean Payton, still regaining his skills and timing as a playcaller, bludgeoned the Dolphins with a dizzying bevy of personnel and formations. It was vintage Payton, king of the exploit. As Drew Brees said after the game, Payton's goal is to "formation [you] to death." On Monday night, it was indeed death-by-formation at the hands of the man who is reacclimating himself and reminding all of us that, yes, coaches do very much matter. For the first time this season, it appeared that Payton was a step ahead at all times, a skill that's separated him as the league's best schemer and play-caller, a master of recognition, foresight, and adjustments. As it stands today, the quick twitch of Payton's brain is perhaps the ultimate offensive weapon in the NFL, and on Monday night, it showed. For their part, the Dolphins (rightfully) appeared to focus their defensive efforts on Jimmy Graham and, in the process, poisoned themselves with a crippling dose of Darren Sproles. Sproles, who over three seasons has seamlessly blended into the Saints' offense and special teams with an ease and impact that Reggie Bush never quite could, sped around Dolphins' defenders as if they were mere cones in a practice drill. Time and again, Sproles, a devastating bundle of short-fused dynamite, exploded through the Dolphins' defense to their unrecoverable detriment. His 222 all-purpose yards and two touchdowns harkened back to Sproles' transcendent 2011 season, and reminded opponents of ill-prepare that Sproles is to be ignored at their peril. Meanwhile, by the time the Dolphins had scrambled to adjust and account for Sproles, Payton and Brees shifted their focus to Jimmy Graham who hulked his way to another eye-popping performance, kneecapping the Dolphins' hopes in the process. 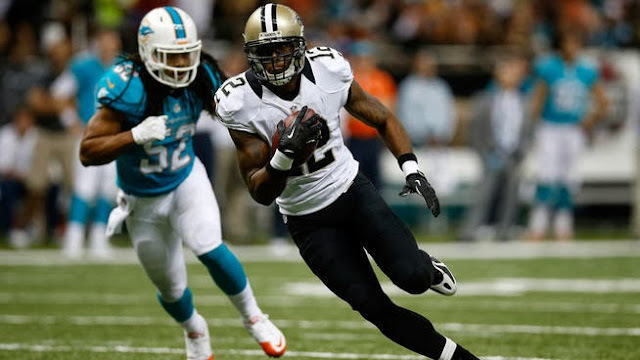 Not yet done, Payton called on Marques Colston to close out the game in the absence of a trustworthy running game. All seven of Colston's catches came in the second half as the Saints' protected and cushioned their lead, bled the clock, and served notice to a national audience that this is a team primed for the rumble. As Jimmy Graham said after the game, those are not so much chips on the team's shoulders as they are bricks. Added to that, through four games, the Saints have one of the league's better defenses. "You think you know, but you don't know. And you never will. Ok? Just for your own information." After professional stints in Arizona, New England, Oakland, Cleveland, and Dallas, Rob Ryan--a lovable gypsy soft-selling his brand of unconventional defense--has truly found a home in New Orleans. Ryan has embraced what was not long ago the most narrow viaduct of hope, and built it into something resembling an ever-widening span of unpredictable frenzy and efficiency. With 25% of the regular season completed, Rob Ryan has the Saints highly perched in several important defensive categories: points allowed (5th), passer rating (3rd), takeaways (5th), red zone scoring attempts allowed (5th), and 3rd down conversion percentage (10th). More impressively, the Saints have yet to surrender twenty points in a game, a stat incredible in itself (all things considered) and one that places the Saints alone with the Kansas City Chiefs in that category. As Wang smartly pointed out last week, the Saints' defense has almost certainly benefited by dint of circumstance. With injuries displacing a variety of players who otherwise would have been playing, this defense might not have emerged had it not all unfolded this way. As a result, the defense has assumed the promising, new face of youth: Jordan, Galette, Hicks, J. Jenkins, Walker, Foster, Wilson, Bush, M. Jenkins, and Vaccaro. At 26 years of age, Rafael Bush is the oldest of the aforementioned ten names. It's a core that is morphing the Saints into a different breed of team they've previously been under Payton. As opposed to the three seasons under Gregg Williams, this feels altogether different with regards to the defense's youth, base efficiency, consistency, and ceiling. It's only a sample of four games against lesser-than-stellar offenses, but it's a start ripe with promise for a group pecking with attitude. And mostly, it's tough to argue with the results. The Saints' schedule should prove much more challenging in the coming two months. Trips to Chicago and New England in the next two weeks, and a four-game stretch in November that includes Dallas, San Francisco, (at) Atlanta, and (at) Seattle will ultimately tell the tale of the Saints' regular season. The Saints have taken care of business in four games where they've been favored; soon we'll see how they respond to playing in difficult road environments and in games in which they'll be the underdog. The die isn't cast quite yet. Sean Payton is aware that 4-0 is of little consequence if the Saints stumble in the next two months. During Monday night's postgame press conference, Payton certainly didn't act like the coach of a 4-0 team fresh off of a 21-point win on national television. Instead, Payton appeared annoyed and cranky. Though he might have been, the likelihood is that Payton was also partaking in a bit of rehearsed acting. Payton, who learned this tactic from Bill Parcells, has often said it's important to keep his players balanced, minimizing the extreme highs and lows of emotion that inevitably accompany each season. Payton has maintained this balancing act, apparently, by being demanding and unsatisfied during the prosperous times, while being reassuring and uplifting during the struggles. After a fast start, it would be easy for the Saints to sit back and admire their early-season accomplishments. But Payton's not going to let that happen, and we saw that soon after Monday's game. "Don't eat the cheese" and all that. When you consider the differences in the Saints with and without Sean Payton, these are the little things that turn mediocrity into excellence: a focus on the big picture, and a plan for getting there. For 2013, the Saints haven't fully materialized their potential (i.e., played their best) and this is probably a good thing, especially considering their record. As bold as this may sound, the possibilities for this team, if and when they put it all together, are as promising as they've been in the Payton era. The best news, perhaps, is that Sean Payton is still rounding back into form as a coach and playcaller. And as he gets better, so will his team. With the Saints at 4-0 and intact with a surging defense, that should be a disconcerting thought for the rest of the NFL.